Mobikwik has come with a superb deal offering flat Rs 10 cashback on recharge or bill payment of Rs 45 or more. The offer can be redeemed only once per user during the offer period. So, hurry up and grab this limited period offer !! How to get Rs 10 cashback ? This entry was posted in Earn Money, Mobikwik, Recharge and tagged billpayments, dth, mobikwik, Postpaid, prepaid recharge. 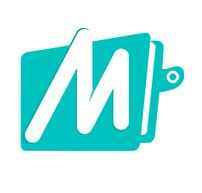 Mobikwik is offering 12% Cashback on Recharge & Bills payments. This offer is not for airtel users. This offer can be get the coupon code only once per user. This entry was posted in Mobikwik, Recharge and tagged billpayment, dth recharge, mobikwik. Mobikwik Coupons 22 February 2016. Latest Updated Mobikwik Coupon Code, Mobikwik Promo Code, Mobikwik Cashback Offers, Mobikwik Add Money Offers For February 2016. Latest Live Mobikwik Coupons & Promo Code For Old Users & New Users February 2016. This entry was posted in Mobikwik, Recharge and tagged billpayments, mobikwik, recharge. This entry was posted in Earn Money, Mobikwik, Recharge. 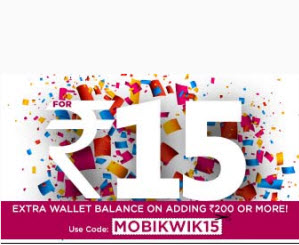 Mobikwik has come up with a good offer in which you get Rs 15 cashback on adding Rs 200 or more to its wallet. Actually, you might think that Rs 15 is nothing but since mobikwik wallet can be used to shop at a number of places so it literally means you are giving someone Rs 200 and getting back Rs 215. Isn’t that good ? This entry was posted in Mobikwik, Recharge and tagged and Instant Money Transfer, Bill Payments, dth, mobikwik, MOBIKWIK15, Online Shopping Purchases, Postpaid, Prepaid, recharge. Mobikwik has come up with a new offer Exclusively for New users.If you are a new user of mobikwik, then this offer is for you.It is giving 60 Cashback on Rs. 60 on Prepaid Recharge, DTH Recharge & Postpaid Bill payment Rs. 75 Cashback on Rs. 350. Offer valid only on Mobile App. Note:-This offer is only for New Users on Mobikwik app. A New user is someone who uses a new device with a new number and uses a new email address to login. The card used to add money needs to be unique as well. This entry was posted in Mobikwik, Recharge and tagged billpayment, cashback, dth, mobikwik, new user, Postpaid. Mobikwik is again back with his “Add money to wallet offer” on the auspicious eve of Independence Day. Now, Mobikwik is giving Rs 100 cashback on adding Rs 1408 or more to wallet. Max cashback is Rs 100. Hurry up !! This entry was posted in Mobikwik, Recharge and tagged Absolutely, free, FREEDOM100, Mobiwkik.